Deborah was a widow. 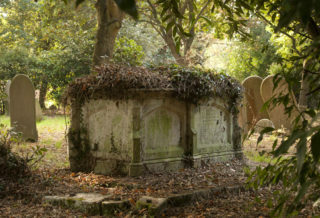 Her first husband, Robert who was an Oyster Merchant, had died in April 1740. Robert was only 42 when he died. Deborah and Robert had 3 children and when Robert died Deborah was pregnant with their fourth child who was born 2 months after Robert’s death. Only 1 of their children, also named Robert, survived into adulthood. Their other children, two girls and a boy died in childhood. The baby Thomas, born after his father’s death, died in infancy. When Deborah married John, she would have been financially very secure as Robert had left her well provided for. However up until 1882, when a woman married, the husband and wife became one person under the law. So the property of the wife was surrendered to her husband, and she no longer had legal ownership of the property that she brought to the marriage. It’s not clear if John was already an oyster merchant when he married Deborah, or if he took on that occupation along with the business that had been left to Deborah when Robert died. Certainly that’s the occupation that John pursued after the marriage, expanding the business and acquiring more land and property. John and Deborah had 6 children, but for the purpose of this story I will only touch on 3 of those children, William, Benjamin and John. When John senior died he left all of his estate to Deborah but stipulating in his Will how his estate should be divided amongst his children when Deborah died. Each of them would inherit either a property or a piece of land. That is, all except John his eldest son, who didn’t for some unknown reason, inherit anything through the will. 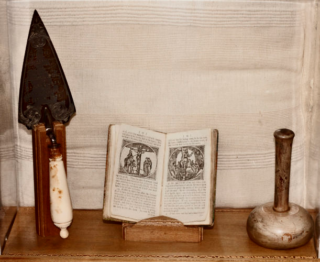 John left the tools of his trade to William and Benjamin who continued to work the oyster trade and expand the business. William Sanford married Margaret Whitley on 28th Sep 1773. They had two children, William and Elizabeth. William, who lived in Trinity House on the Quay, also had various other businesses and properties, particularly on the Quay. He owned the coal yard, malting offices, a wharf and warehouses. He had oyster layings in Wivenhoe and Tollesbury. He also owned farmland in Wivenhoe and Fingringhoe. During the period of working the oyster business, from 1802 to 1827, William kept a journal which was part diary and part account book. He recorded various events that occurred in Wivenhoe as well as events that were happening further afield. In 1964 John Leather, a local writer, wrote an article for the Essex County Standard newspaper using the information contained in William Sanford’s journal. This article is a beautiful slice of local history. 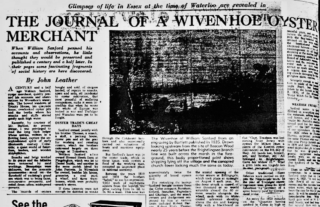 Note: The full article can be read here and is worth reading for anyone interested in a peep at Wivenhoe during the period. William retired in 1827. But before doing so he sold his shares in the business, boats and packing warehouse to his nephew Thomas Sanford. One of William’s last entries written in the journal was: ‘Is the last year of me Wm. Sanford, having anything more to do with the oyster trade.’ This entry was written twice on the same page. I wonder if the statement was written twice to emphasise his decision or maybe it was with a sigh of relief at reaching a point when life would be easier. Or perhaps some other reason completely. What John Leather observed from William’s accounts was that his wine bill increased substantially. I hope that William was just happy to sit back and let someone else take on the responsibility for running the business. 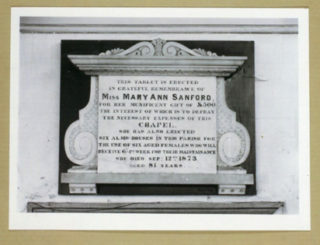 Following William’s death in 1830, a memorial tablet was erected in St Mary’s Church in remembrance of the charity set up by him for the benefit of local residents. Income from this charity was used to buy bread for poor people of Wivenhoe. Less is known about Benjamin. He never married and had no children, but seemed to have a very close relationship with his nephew Thomas. Benjamin died at the age of 89. In his will he left instructions for the setting up of a Charity similar to his brother William. It was 50s yearly to buy coal for a number of the poorer residents and was administered by the Church. When he died, Benjamin was a very wealthy man and most of that wealth was inherited by Thomas with legacies being left to his other nieces and nephews, including Mary Ann Sanford, sister to Thomas Sanford. This was the start of Mary Ann’s accumulated wealth. Thomas and Mary Ann’s father, John Sanford, didn’t follow the trade of his father, also somewhat confusingly called John. John married Ann Barker and they had seven children. Two of whom died in infancy. His occupation was as a Cordwainer, who made shoes from new leather. This differs from a Cobbler who by tradition was only allowed to mend shoes. A Cordwainer and a Cobbler belonged to different Guilds and I imagine the former would have been considered to be a craftsman and of higher status. The shoes that John made, were sold through a shoe shop in Wivenhoe which was probably owned by John. It has not been possible to know what kind of wealth John might have accumulated as I was unable to find a Will. John died at the age of 52. What is known is that John’s eldest son and namesake continued the trade with his mother after his father’s death. This next generation of Sanfords were probably the ones who really left their mark on Wivenhoe in the most significant way. Thomas Sanford was now the main owner of the Oyster business which passed to him following the death of his uncles William and Benjamin. As with other family members, Thomas went on to expand the business and also increase his land and property ownership. Along with the inheritance he received from various family members, Thomas became a very wealthy man. This allowed him to do much good for the people of Wivenhoe. The main and most obvious of these acts was that he financed and employed an architect to build a new Congregational Chapel in West Street. The chapel that was in use at the time, also in West Street had become too small for the congregation. This was when Thomas decided to have a new chapel built at a cost of £2,400. 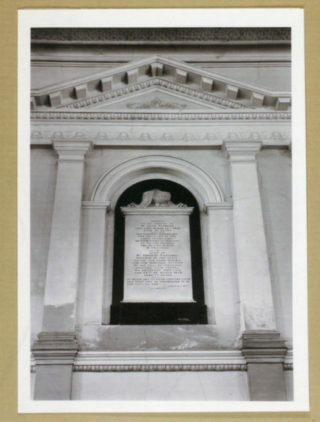 The foundation stone was laid on 21st Apr 1846 and the chapel was completed on 28th Apr.1847. It was built to accommodate 600 people and on the day of the first meeting not one seat was empty. People came from all around Wivenhoe and preachers from outside the area came to preach at that first meeting. After the meeting, lunch was provided at The Falcon Inn for over 150 people. Lunch was also served in the old chapel for an additional number of people who could not be accommodated at The Falcon. 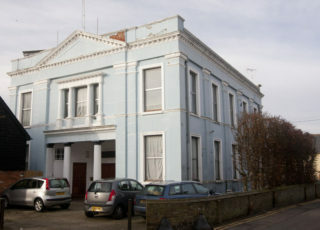 Following the building of the chapel, Thomas’s brother John, who lived in East Street with his sister Mary Ann, decided to have the old chapel converted into a school. There was a lot of changes happening with regard to education during this period. This was in part due to the Factory Acts of 1833, 1844 and 1867 which imposed restrictions on child labour, and education of children became a more favourable alternative. The school built by John Sanford also ensured that children of the chapel congregation would be taught under the umbrella of the Congregationalist belief system. The school opened with 190 pupils. At some point the school started to have financial difficulties. Fees did not cover teachers salaries and in December 1853 the school committee resolved that as the funds of the school were inadequate to meet its expenditure, notice should be given to the present teacher.The school closed in 1853 and reopened in the chapel vestry in 1856. It continued through to 1866 but there was no recording of it in 1870. The third member of this generation who left a lasting legacy was Mary Ann Sanford. In 1873, the year in which she died, when she was aged 81, Mary Ann financed the building of six almshouses in Rebow Road. The houses were intended for single women and the widows of sailors. memorial stone of her almshouses in Wivenhoe. Mary Ann died in the September of 1873. She died Sep 12th 1873. Aged 81 years. Mary Ann not only provided a secure home for many women, but by ensuring they had a regular income she gave them financial security as well. The amount they received was more than the old age pension of 5s, which started 30 years later and the recipient had to be over 70 years of age. I imagine her as a person of compassion, foresight and conscience who wanted to leave a lasting legacy which would benefit women into the future. Which is exactly what she did. When Mary Ann died, the only member of that part of the family was Kezia who had married William Hines. Kezia continued the work of her sister by keeping contact with the almshouse residents and there is at least one newspaper report which shows that Kezia invited the residents to her home for afternoon tea along with the trustees of the almshouses. When Kezia died in 1885 she bequeath In her will the sum of £500 to be used by the trustees for the benefit of the almshouses and the residents. There were also a number of charitable bequests to benefit the poor of the parish. As well as the many charitable legacies Kezia did not forget her long term servants, namely Esther Barrel to whom she left £50. After various bequests to a number of individuals Kezia left the residue of her estate to George Sach. Exactly what this amounted to is not clear but what is evident is that George is shown in the census of 1891/1901 as living at Tye Farm as a farmer, which previously he was living as farm bailiff in the employment of Kezia Hines. Living there also was Esther Barrell as housekeeper. A step up from house servant. But the family will not be forgotten as long as the almshouses continue to stand in Rebow Road and many women pass through their doors as residents to benefit from the legacy of Mary Ann Sanford, and the Chapel building still exists although now converted into apartments. This page was added on 28/07/2017. Thanks to Frances for her assistance. That is greatly appreciated. The Brantham Sandfords seem to be a good fit , although the family search .org engine shows the surname as Phoebe Saniford, Born 25th Feb 1787. Could be a typo mistake perhaps? There is a marriage between a John Sandford and a Phoebe Crisp dated 18th June 1782, which leads me to believe they could be Phoebe Sandford’s mother and father. Is it likely that there was a connection between the Brantham and the Wivenhoe Sandfords?. If I find anything connecting them I will certainly let you know. I assume that as John Mason was working as a sail maker and then a Mariner he would have been employed in Wivenhoe. Perhaps he might even have been employed by the Sandford family. Are there any employment records available to verify this? I believe there may be a family connection between the Mason Family and the Sanford Family. I note in archive a James Mason married Elizabeth Sandford 18 Dec 1764.They went on to have further children Elizabeth mentioned twice 1766 and 1767 ?. Deborah 1769, Susanna 1772. My ancestor John Sanford Mason was born in Wivenhoe 1814. his parents were John and Phoebe Mason. I am trying to find a link between James Mason/ Elizabeth Sanford and John and Phoebe Mason. Can you help or advise please. I have traced a Phoebe (sometimes spelt with or without the o.) Sandford bap. 25 Feb 1787 in Brantham, Suffolk. Parents John and Pheobe Sandford. Phoebe married a John Mason on 25 Sep 1808 in Brantham, Suffolk; John Mason’s parish shown in the parish register as St Mary Magdelene, Colchester. A John and Pheobe Mason show up in the Colchester census for 1841/51/61. Living in Hythe Street. In 1861 both children appeared to have married- now Elizabeth Hunter. There are two grandchildren, William and Caroline Pilgrim, but their mother is not present. Through all of these documents John Mason is listed as mariner/sailmaker. This seems the most likely Sanford/Mason connection that you are looking for. I would be interested to know if you do find any connection to the Wivenhoe Sanfords. Re the two Elizabeths in the Wivenhoe Sanford tree, both shown in the parish reg born to James Mason and Elizabeth (nee) Sanford. It could be that the first Elizabeth died, although I could find no record of that. Sometimes when a child dies, a following child is given the same christian name.